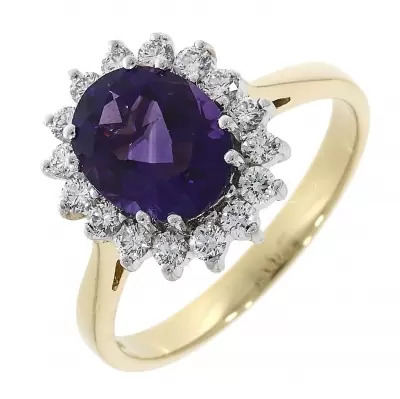 Violet is a beautiful colour that has been widely associated with royalty in bygone ages, and it is not a hue that tends to be especially widespread among gemstones. 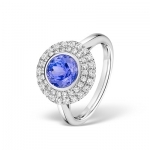 One of the foremost types of gemstone that exhibits this colouration is the quartz variant known as amethyst. Quartz can, of course, come in many different hues, but ‘amethyst’ is the accepted name for any of this mineral that is predominately tinted violet. This striking stone was especially prized by certain ancient civilisations such as the Greeks or Romans, where it was painstakingly engraved to great effect. In modern society, the amethyst is perhaps best known for being the birthstone choice for those born in February, but our amethyst gemstone rings are superb no matter what occasion they are intended to commemorate. Amethysts are almost habitually violet in terms of colouration, but the exact hue can vary between individual stones, as tends to be the case with most precious minerals. For example, one amethyst could be strongly upon the pinkish side of the colour spectrum, whilst another selected stone might be a deep and opulent purple. 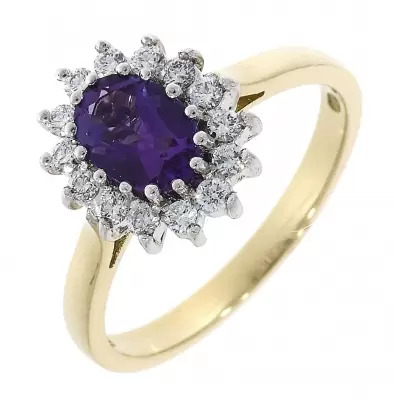 The attractive aesthetics of amethyst gemstone rings, coupled with the innate hardness of amethyst (it possesses the same durability as closely related quartz), makes it an ideal choice for gemstone rings and other forms of jewellery. When it comes to sheer variety of amethyst gemstone rings, you’ll not find any better stock than the collection right here at Banks Lyon. Because we specialise in the design and creation of bespoke jewellery, we can provide some exceptionally special – even unique – rings, so you can rest assured that we can furnish you with exactly what you’re looking for. To place an enquiry or find out more information about our professional jewellery service, be sure to contact us by calling 01524 38 48 58 or send us an email at Personalshopper@bankslyon.co.uk.